Purchasing Coastwide Shade Sails is a significant investment, which makes it perfectly understandable why many would consider to DIY its installation of shade sails. 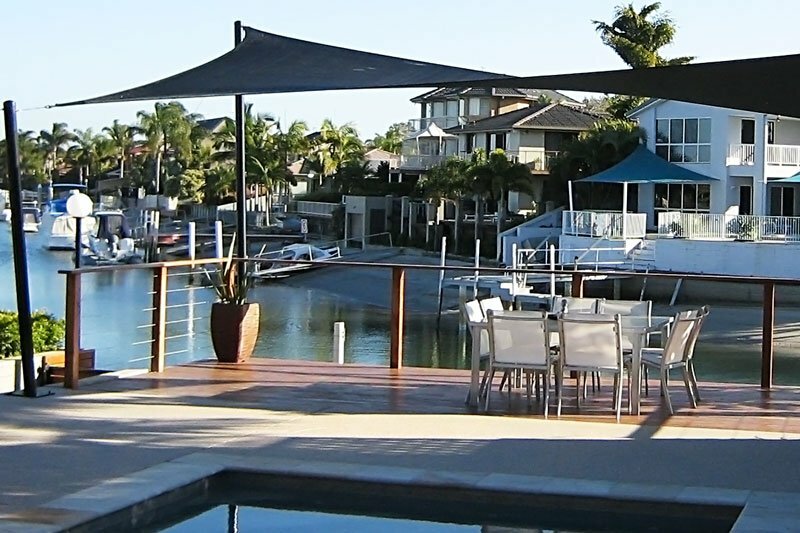 The question is, is it worth the risk or are you better off calling in expert Gold Coast shade sails installers to get the job done right? The first step in this process is to carefully plan out where you want to install your shade sail. Once you have determined the location, you need to identify the ideal fixing points for the corners. If you have a pergola, fence post, or a large tree, you can consider them as possible fixing posts for your shade sails. Like the types and designs of shade sails, there is a large selection of fixing accessories to choose from. This will be used to secure your shade sail in place and are normally available in regular hardware stores. If you are not quite sure which one to pick, consider soliciting the advice of professional to determine which one best suits your installation. If you plan to attach your shade sail to a tree, please keep in mind that this should just be a temporary use and should have a diameter of at least 250mm. You will need to assign a permanent fixing post. If you are planning to fix your shade sail to a fascia, it is highly recommended to use a fascia support, which can be connected to overhangs of trusses or rafters. This will provide a sturdier connection and better stability. Lay a 100mm (4”) depth of 20mm (3/4”) diameter gravel at the base of the post. Pour a 100mm (4”) depth of concrete at the bottom of the fixing post hole in order to provide a solid pad. Temporarily brace the posts. Mix concrete following manufacturer’s instructions. Check for any special instructions that may be required for your particular application. As you may have deduced by now, installing shade sails on your own can be quite tricky. If you don’t have the basic knowledge of shade sail installation, it might be a good idea to call in the experts. When it comes to preserving the beauty, and extending the life of shade sails and outdoor umbrellas, proper maintenance is important. Like Gold Coast shade sails, your outdoor umbrella will be exposed to the harsh elements for extended periods, along with dirt and pollution, not to mention occasional bird droppings and tree sap. If you are keen on protecting your outdoor umbrella from wear and tear, regular cleaning is a must. Whether it’s made from vinyl, solid vinyl, vinyl mesh, canvas, or other stretchy materials, it is important to learn the proper care. In general, most outdoor umbrellas make use of treated acrylic fabric, which is a popular choice since it is known to repel moisture, mildew, and stains. However, most outdoor dirt embeds in the fibers, which can cause, which can result in unsightly stains. When in use, regular cleaning of your outdoor umbrella is a must — at least once a month. Increase cleaning frequency if your umbrella is placed near tall shrubs and trees. When removing dirt, you can use a soft bristle brush or a vacuum to avoid driving dirt deeper into the fabric using a circular motion. Instead of using dish soap, as many opt to do, it is generally best to use 1/4 cup of laundry detergent for every gallon of lukewarm water. Use a good quality laundry soap that will help effectively remove fabric stains. Allow the detergent solution to soak into your umbrella’s fabric for 15 to 20 minutes to remove stubborn dirt before rinsing it off with a hose sprayer. MIldew and tree sap can cause heavy straining on outdoor umbrellas. In such cases, you will need to use stronger cleaning solutions. Prepare the following cleaning solution: 1/4 cup laundry detergent per gallon of lukewarm water mixed with 1 cup chlorine bleach. Make sure to wear protective gloves when working on the solution using a soft bristle brush. Aside from the canopy, you also need to clean the frame. When available, always refer to the manufacturer’s instructions. You can use a soft bristle or a soft cloth to wipe the frame’s surface and allow it to air dry.